The past couple of weeks have been quite eventful in the context of the “reformist” deformist attack on Islam. There is no longer a need for a smokescreen of social issues behind which to mount the attack. It seems to be the case that the events like the actions of ISIS have provided a sufficient pretext to renew the call to deform Islam. This, despite the fact that scholars from different theological backgrounds have continually expressed their revulsion at ISIS activities, not as a matter of political expedience but through Islamic textual deductions. “We need an Islamic reformation and I think there is a real hope for one”. The fountains of traditional Islamic learning also came in for neocon smear. In a speech at Georgetown University on the 30th of October 2003, Wolfowitz described madaaris (Islamic schools) as “schools that teach hatred, schools that teach terrorism” while providing free “theologically extremist teaching to ‘millions’” of Muslim children. In short, the plan of action was, and still is a “conveyor-belt” to disbelief. Aside from the caricaturised “evidence” ascribing Islam to be the cause of violence (the cause of the violence in the Middle East has been discussed at length in a previous blog here and here), and the monochromatic, tired, colonialist demarcations of the entire Muslim population, her proposals are frankly absurd. She states that some will find her suggestions offensive, and throws in the old “they will kill me” cliché. It is offensive, however not because the suggestions are offensive to Muslims per se, but rather, because they are an insult to the intelligence of Muslims. Dressing up her own state of disbelief in the garb of heresy, and then asking for “amendments” to the Islamic belief system which render one a disbeliever of the faith is insanity. Removing the concept of prophesy, disregarding as a matter of belief the Qur’an to be the word of Allah, insulting the attributes of Allah by insinuating His words are not timeless and effectively trivialising the meeting with our Creator. What is their left of a Muslim!? Root and branch, her ridiculous postulations are misleading and highly manipulative. At a purely discursive level, this is what happens when epistemologies are confused, which in itself provides evidence of ethnocentric bias: the good white man (or a ventriloquized neocon Somalian in this case) has the antidote for the “backward” Muslim. “he would probably throw one third of the Quran in the rubbish bin and say let’s start all over again”. Her ascension toward the highlands of deform was buttressed by Maajid Nawaz, who endorsed her new book and her as a welcome contribution to reform, ridiculously believing her views to be changed – the method of skinning the cat may have superficially changed, not necessarily the decision to skin it. 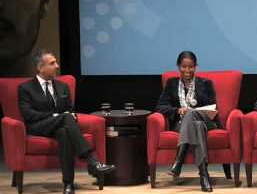 In turn, Ayaan “endorsed” the effort of Maajid Nawaz and Quilliam deform theologian Usama Hasan. Though Ayaan believes in disregarding verses for “reform”, Nawaz and co belief in “reinterpretation” of the Islamic texts, where Usul al-Fiqh (principles of jurisprudence) is transplanted with the toxic formaldehyde of post-modernist, deconstructionist Usul al-Nafs (desire). This cloud nine bubble ensconced in Platonic love created amongst themselves (at one point in the discussion between Ayaan and Nawaz, they declare their like for each other) was abruptly popped as Max Blumenthal published his ripping dissection of the lies pedalled by the deceptive Ayaan. It was a cataclysmic end to her as well as the deform agenda. Her entire façade is based upon deception, as are her claims. She is but a mere reflection of her neocon alignment. Indeed Nawaz, usually one keen to respond to Tweets was unable to condemn Ayaan’s deception which would no doubt fuel anti-Muslim hatred. What perhaps drives the final nail in Ayaan’s coffin of deformation calls is the recent report of her calling for Benjamin Netanyahu to be awarded a Nobel Peace prize. “I really admire Netanyahu”, she said, proving her neocon Zionist, credentials. She, of course, has no problems with the fact that he based his war against the most densely populated 25 mile strip of land on a lie, and that children were spliced to pieces thanks to experimental munitions, nor the fact that the relentless bombardment resulted in a circa 76% casualty rate. No, this violence is lovely; as are rabbinical exhortations prior to Zionist massacres, and as is the fact that Netanyahu has promised a Jewish state based on Talmudic law. These minor details are not a problem for Ayaan. No, Netanyahu deserves a peace prize! Lies, deceit, double standards. We’ve been here before. These were the same neocon traits permeating Western policy which have now led to the mess in the Middle East. As a “scholar” of the neoconservative AEI, Ayaan, her pathetic rhetoric and her dismal, Zionist support for individuals like Netanyahu reveal the reality of this deformist call. A clue can be seen in the other “scholar” at AEI: Paul Wolfowitz. Perfection of Islam was attained during the time of the Prophet peace be upon him, and preserved by those with meticulous characters, with hearts freed from the shackles of the world, and devoted to intricate sciences of Islamic knowledge. Indeed we are beginning to live in an era where Islam and Muslims are being treated as something strange, thereby justifying unwarranted, groundless calls for an attack on the fundamentals of a belief system reverberating in the hearts of one fifth of the world’s population. The paradigm of Islam centres around its sources and methodologies which were born in the Prophet’s time and expanded during the period known as the best of generations (khayr al-Quroon). A logical inference is that suppositions that deviate away from this crystallised fundamental understanding, or propose to destroy through “historicisation” core Islamic texts and postmodernist bumbling of free market “interpretation”, is not Islam. It is a deformity alien to Islam. The call to deform Islam is coming from an epistemology grounded in the Western secular liberal paradigm, bolstered by ignorant comparisons with the Christian reformation period. This is the exoteric perception. The esoteric epistemology is in fact neoconservativism, and digging deeper, Machiavellian philosophy, which exaggerates or architects an enemy to pursue their disturbing, authoritarian goals and pursuit for power. As with all previous attempts, the defomist call grounded in a morally reprehensible philosophy will fail, regardless of the fact that the person making the call is a “Muslim” or not. A section of the Jews underwent the “Haskalah”, a reformation derived from enlightenment philosophies in the late 18th Century, in order to assimilate. German Jewish philosopher Moses Mendelssohn for instance, introduced texts which, like the desire of Maajid Nawaz to create a new tafsir based on liberalism, introduced commentaries which “counteracted” the orthodox, rabbinical method of exegesis. The Haskalah eschewed the orthodoxy and secularised the faith with the emphasis being placed on science and philosophy. The Talmud was removed from its central position in education. Indeed this was driven in part by an edict by Joseph II, which required Jews to establish normal schools (much like the way in which “British values” are engineering a “liberal Islam” through coercion). The importance of God’s commandments was de-emphasised as not necessary to remain orthodox. In Europeanising themselves, reform Jews, leaving behind their own manner and mores, began to adopt Christian practices in their Synagogues. As Jews assimilated, Jewish law lost its importance. It has to be noted however, that despite this, Jews were still discriminated against, their beliefs were still targeted, gas chambers were still built, and a genocide still took place. In this are lessons for us all. This entry was tagged American Enterprise Institute, anders breivik, anti-muslim, assimilation, Ayaan Hirsi Ali, Ayaan Hirsi Ali liar, Benjamin Netanyahu, British values, Conveyor Belt to Disbelief, epistemology, Haskalah, Hirsi Ali Wall Street Journal, Islamic reformation, Jewish enlightenment, Maajid Nawaz, Machiavelli, Machiavellian politics, Max Blumenthal, Moses Mendelssohn, neoconservatism, neoconservative, Paul Wolfowitz, rand, reform editing, reform interpretation, reforming Islam, secular liberalism, Talmud, Zionist extremism. Bookmark the permalink. JazakAllahu Khayran, your articles are Alhamdullillah amazing, you had me ‘lol’ing at “conveyor belt to disbelief” subhan Allah. May Allah protect us, Ameen. I think the connection with the Jews is useful: and also we can see something similar with the Catholic Church and Native Americans – the drive for the individual to be sundered from all communal obligations/communal beliefs (save allegiance to the nation-state) proceeded with various levels of relatively peaceful pushing, sometimes with martial force, sometimes led to genocide, and so on. We Muslims should study the history of what happened to all these groups and where they stand now, so that we can intuit wht might happen to us if we sit down pat.